The De La Rue Lanka plant in Biyagama prints more than a billion banknotes a year and supports the currency needs of over 30 countries worldwide, including Sri Lanka. The site employs over 300 local people and is one of De La Rue’s three key Centres of Excellence for global banknote production. A successful joint venture with the Ministry of Finance since 1987, the De La Rue Lanka facility is one of the longest and most successful examples of inward investment in Sri Lanka. Speaking at the celebrations to mark the 30th anniversary of the Joint Venture, James Dauris, British High Commissioner in Sri Lanka praised the success of the initiative, commenting that the site contributes over LKR 1.9bn (£10m) every year to the local economy in the form of wages, taxes and other spend related to the running of the facility. The De La Rue facility is also supporting an extended supply chain ten times the size of our direct workforce – in terms of local suppliers, logistics and security. 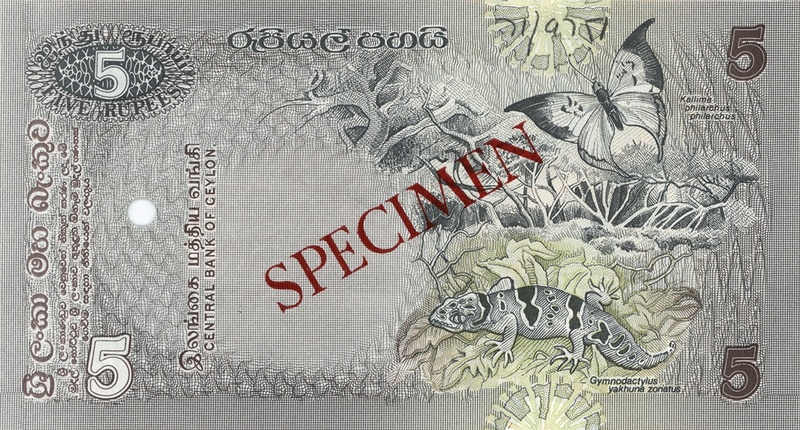 Originally, the site only produced banknotes for the Central Bank of Sri Lanka. Today however, over 80% of the banknotes produced at Biyagama are for the export market. 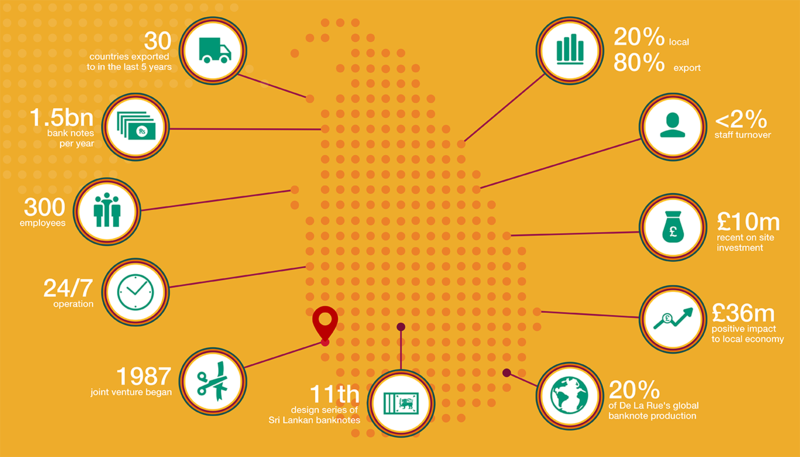 The Government of Sri Lanka and De La Rue have an established and successful Public Private Partnership that has been operating for over 30 years. The Government of Sri Lanka owns 40% equity share in De La Rue Lanka Currency and Security Print in Biyagama. De La Rue has invested around SLK 7bn on site in recent years to expand the manufacturing capability for our worldwide clientele which includes no less than 140 Governments. As a result of the expansion of our plant, our workforce has more than doubled over the last 10 years and De La Rue Lanka now boasts some of the most state-of–the-art, modern security printing equipment found in any of De La Rue’s worldwide manufacturing facilities. De La Rue Lanka is the only print facility across Asia to have achieved the highest level of security accreditation – ISO14298 – and is currently benefitting from an investment programme of LKR 2bn (£10.2m) to upgrade its global capability. The first phase of this programme (an investment of LKR 1bn [£5.6m]) has recently been completed to deploy ‘Single Note Inspection’ machinery at the plant. When a customer requests this level of service for their currency, every single one of their printed banknotes will be rigorously checked using the very latest techniques and technologies, passing the most stringent quality standards and ensuring that all notes used by consumers are of a consistently high quality. Building on the existing partnership De La Rue has with the people of Sri Lanka, as well as giving a continued commitment to the printing of banknotes at this location, there are also plans to invest and further develop the site with the installation of a world class passport production line, bringing more funds, jobs and opportunities to the island as well as developing local skills and an increase in the value of contribution to the local economy. De La Rue also works closely with the Central Bank of Sri Lanka to provide data driven insights via DLR Analytics™ – a Cloud based analytical software solution – through reports, charts and statistical models that give the bank greater control and enables it to manage its cash cycle more effectively. De La Rue has been active and present on the island for over 160 years – first producing postage stamps in 1857 and then from 1885 until the present day, De La Rue has printed the national currency for Sri Lanka. 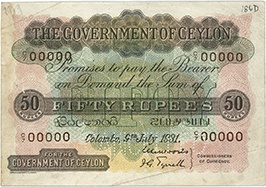 The first notes that we produced were for The Government of Ceylon, and included denominations up to 1,000 rupees. 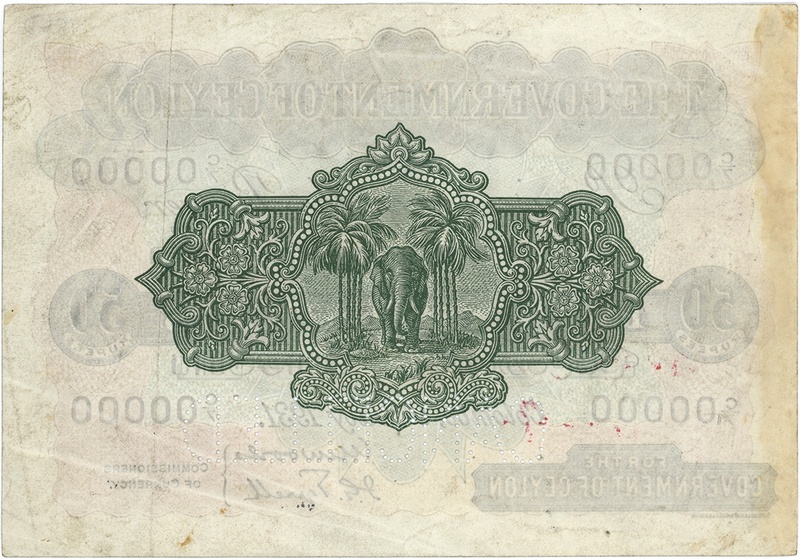 Lower-value notes, the one and two rupees, were introduced in 1917. 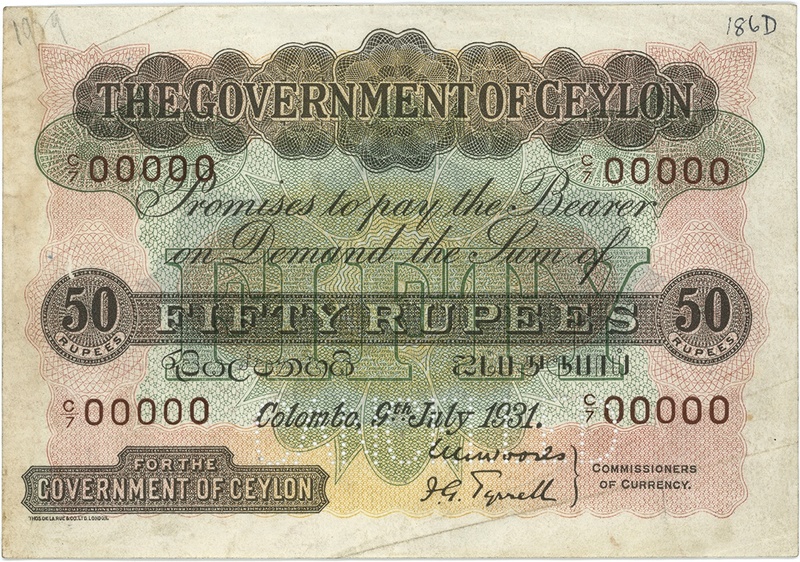 The first issue of notes for the newly established Central Bank of Ceylon were printed in 1951 by Bradbury Wilkinson, a company later acquired by De La Rue. Bradbury then printed a series of new issues until 1970. 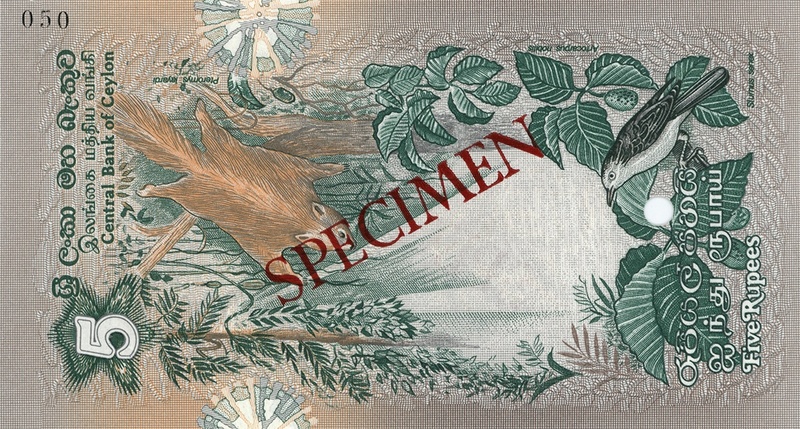 De La Rue and Bradbury Wilkinson then printed a new series of notes, including the "flora and fauna" series and the "historical and archaeological" series. 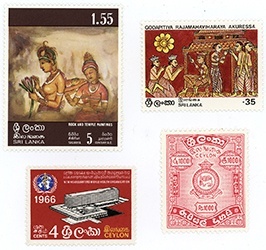 A joint venture was agreed with the Government of Sri Lanka in Biyagama in the 1980s followed and since then De La Rue has continued to invest in the factory, its employees and capabilities. Still working with the now named Central Bank of Sri Lanka, we are today currently producing our 11th family of banknotes for Sri Lanka, with a set of designs that feature strong local Sri Lankan themes including Sri Lankan landscapes and industries, and images depicting the island’s strong culture, history, and achievements.